Exhibitors may register for booth space at the Calgary City Teachers' Convention using the online submission form. After registration information is submitted, exhibitors will be taken to a payment screen where they can pay for their booths using credit card payment or by cheque. Registration is not considered complete until payment is received. If an exhibitor submits the online registration form but payment is not received, booths are not considered reserved and will be made available to other exhibitors. Booths cancelled before September 1st will receive a refund less a $50.00 cancellation fee. Booths cancelled after September 1st will receive a refund less a $100.00 cancellation fee. Booths cancelled after December 31st will not not receive a refund. When completing the online form, please limit yourself to using only basic characters (letters, numbers, and punctuation). Your username cannot include a space or special characters. If you submit this form and get a "Forbidden" error message, this is likely the problem. If you need help, please contact cctcaexec@gmail.com. Describe the sorts of information/services/products that you will provide at your booth. This information will be visible to teachers through the website so please write in complete sentences and check your grammar and spelling. By typing "YES" in the box below, you (the "exhibitor") accept full responsibility for all property which the exhibitor displays or is authorized to display during the course of the Calgary City Teachers' Convention in the allocated portion of the Calgary TELUS Convention Centre premises. All liability for loss or damage of such property whatsoever shall be the sole risk of the exhibitor, notwithstanding that such loss or damage may have arisen through the inadvertent or negligent acts of any person, including any and all members of the Calgary City Teachers' Convention Association, or the staff and subcontractors of the Calgary TELUS Convention Centre. The exhibitor shall protect and save harmless the Calgary City Teachers' Convention Association from and against any claim for any loss connected with or related to the presence and use of property. The furnishing of any service or assistance shall not be construed to be any assumption of obligation or duty with respect to the protection of the property of the exhibitor, which shall at all times remain in the sole possession and custody of each exhibitor, and shall be the sole responsibility of each exhibitor. 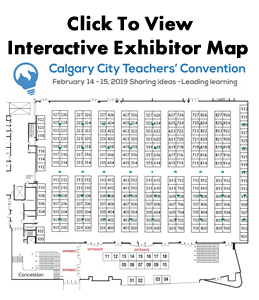 The exhibitor acknowledges that the Calgary City Teachers' Convention Association's booth policies have been read and understood. The Calgary City Teachers’ Convention Association reserves the right to cancel booth registrations and refund exhibitors at its discretion.